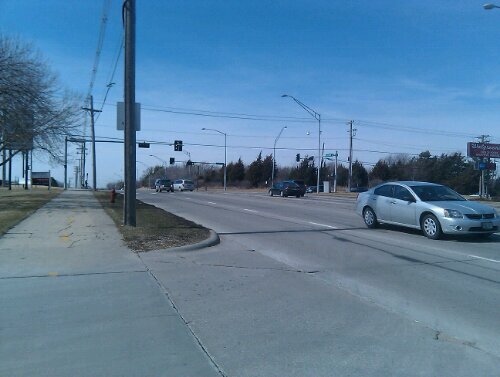 The city is buying up property along 14th Street from Superior Street to Alvo Road to make way for a nearly $11 million, two-mile road project whose centerpiece will be the city’s first double roundabout at 14th and Superior. The project will be paid for with city dollars, according to Devin Biesecker, who works in engineering services for the city public works department. The project is in the final design phase and will be advertised for bids later this year, with construction slated to begin in one year. Biesecker said the Nebraska Department of Roads also plans to build a new bridge over Interstate 80 on 14th Street later this year. The city considered putting a traditional intersection at 14th and Superior, with dual left turns, two through lanes and a right turning lane — and the estimated cost was $10.2 million (in 2009). But city models indicated a roundabout would handle traffic better than a traditional intersection. Roundabouts are considered much safer than regular intersections — but they can be pricier. The city has about 20 roundabouts now. Biesecker said a large volume of traffic goes through the intersection and the nearby two-lane county road needs improvement. Augusta Dr. and Troon Dr.
Trinidad Rd. and Humphrey Av. Glenneagle Ct and Augusta Dr.